Farm industry lobbyists and the GOP chairman of the House Judiciary Committee will try again on October 24 to pass a bill that would let companies import an army of 1 million low-wage visa-workers for a wide variety of Americans food-sector jobs. By stripping away labor protections that evolved over decades in response to abuses, the proposed H-2C visa program would subject hundreds of thousands of U.S. farmworkers to job losses and lower wages, and would allow exploitation of vulnerable guestworkers … the Agricultural Guestworker Act reaches beyond traditional farm jobs to include agriculture-related processing and manufacturing jobs, as well as forestry and aquaculture. This is the second attempt to pass the H-2C visa-workers bill out of the House Judiciary Committee, which is chaired by Virginia GOP Rep. Bob Goodlatte. His Virginia district includes several turkey and chicken processing plants which employ many low-wage migrants and refugees. The prior vote was canceled October 3, when the farm-industry lobbyists could not win enough votes from reluctant Republican and Democratic legislators. Many polls show that Americans strongly oppose the cheap-labor immigration policy which displaces Americans workers. The committee tried to weaken opposition by announcing the surprise vote on Monday, one day before the planned Tuesday-morning session. Goodlatte has also scheduled time for a vote on Wednesday, giving more time for the industry lobbyists to strong-arm legislators. The huge supply of temporary H-2C visa-workers would drag down Americans’ wages because the outsourcing workers would be paid a government-set wage slightly above the minimum wage. Also, they would be cheaper than Americans because employers would not have to pay their housing or transport costs, or even ensure a guarantee of full-time work, according to the bill. 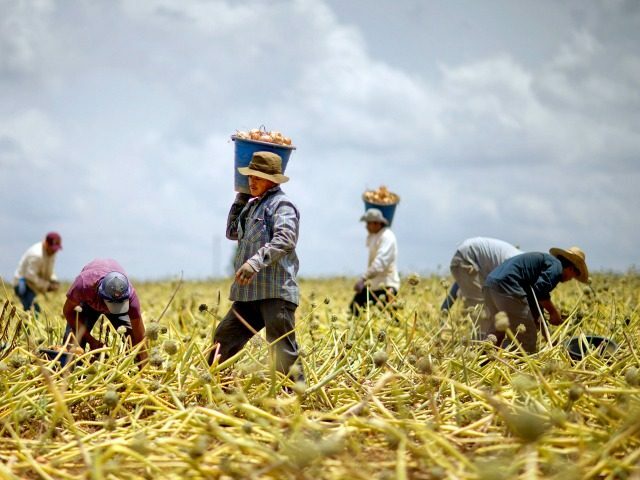 The farm companies may also avoid paying Social Security taxes, as they can now avoid paying Social Security taxes to workers in the fast-growing H-2A farmworker program. The bill would also reduce marketplace pressure on farming companies to move past low-wage manual farmwork, and instead invest in the high-tech labor-saving farm machinery which is being developed and used in high-wage, high-productivity farm companies in Europe and Japan. The cheap-labor bill also would reduce the ability of new companies to profitably hire urban workers for “vertical farms” in urban warehouses which can provide fresh produce to local consumers. The bill is also important because business groups will try to combine it with the huge, expensive and unpopular ‘Dream Act’ amnesty for roughly 3 million younger illegals. If combined, farm industry groups will pressure rural GOP legislators to back the Dream Act amnesty sought by Democrats and other business groups. But that amnesty fight will create headaches for Republican and Democratic legislators because the public strongly opposes cheap-labor amnesties which displace Americans. In 2014, the GOP’s pro-amnesty Majority leader, Virginia Rep. Eric Cantor was defenestrated by his primary voters. It is illogical to allow employers to hire more guestworkers without first addressing the need to legalize the hundreds of thousands of experienced farmworkers who are already contributing to our economy and society, many with U.S. citizen children and deep ties to their communities. Our agricultural labor system deserves a real solution that provides a path to citizenship for farmworkers, as is offered in the Agricultural Worker Program Act introduced by Rep. Gutierrez (D-IL) and Sen. Feinstein (D-CA). If Goodlatte’s bill allowed farm workers to get citizenship, most would quickly migrate into towns to compete for better jobs. That migration would force down wages paid to urban Americans, and would also leave the farms free to replace the departed workers with another wave of temporary or illegal workers. To win the support of pro-American reformers and voters, Goodlatte’s bill is being packaged with a popular bill that would require companies to verify that new hires can legally work in the United States. That is a top priority for immigration reforms groups because it would reduce the iring of illegal immigrants and force up wages for Americans. The “E-verify” bill was developed by Texas Rep. Lamar Smith, and it titled the Legal Workforce Act. “Nearly 20 million Americans are unemployed or underemployed,” Smith said in a statement. “Meanwhile, seven million people are working in the United States illegally. By expanding the E-Verify system to all U.S. employers, this bill will ensure that jobs only go to legal workers.” Smith is also pushing for passage of a bill that would raise Americans’ wages by reducing the labor supply of unskilled immigrant workers. The H-2C bill would allow agriculture companies to import 500,000 new workers each year, under the supervision of the business-first Department of Agriculture, and it would grow the annual cap by 10 percent whenever the food industry runs out of H-2C workers. 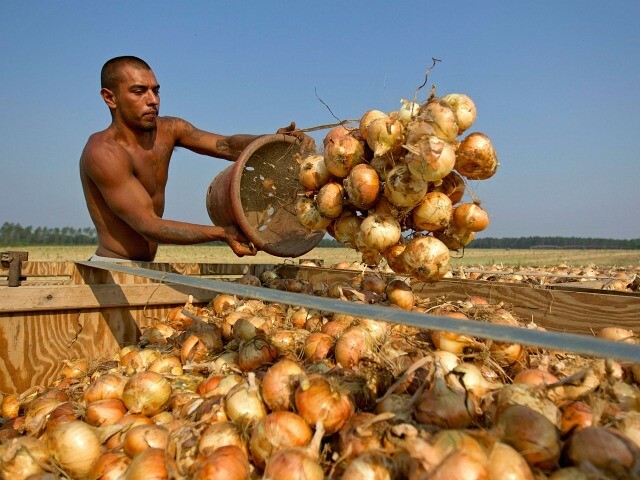 May 10, 2011; A field worker empties a bucket of Vidalia onions into a waiting truck in Lyons, Ga. Skilled H-2C workers could stay for three years, and unskilled H-2C workers could stay for 18 months. Both categories could return to work after a 45-day visit home. Those long residency periods would provide the industry with a resident population of roughly 1 million foreign workers. Initially, the roughly 500,000 illegal immigrants now employed by the industry could be hired while also being exempted from the 500,000 cap. Also, workers hired under the H-2A guest-worker programs — at least 160,000 in 2017 — would also be given H-2C permits but would be exempt from the 500,000 cap. ‘(2) REPLACEMENT OF ALIENS.—An employer may designate eligible aliens to replace H–2C workers who abandon employment notwithstanding the numerical limitation found in section 214(g)(1)(C). The bill includes minimal protections for American and H-2C workers. For example, farm companies are supposed to advertise jobs so that American workers can apply — but few Americans will apply once the wages drop to levels set by the federal government. Also, agriculture companies can keep their imported H-2C workers idle and unpaid for up to 50 percent of the time they are in the United States. Those workers can complain but must hire their own lawyers and comply with the judgment of an arbitration process. 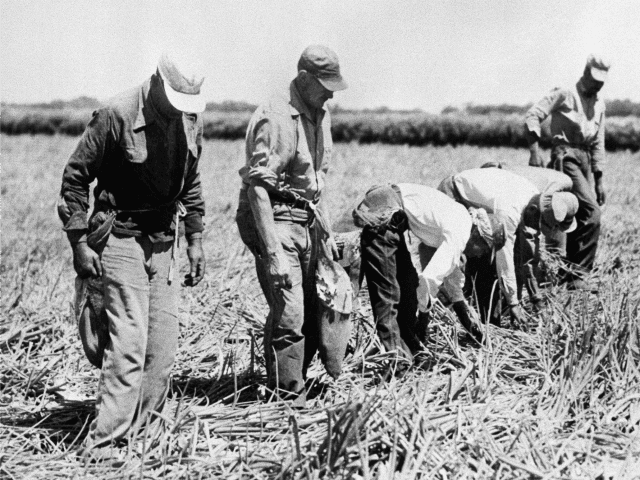 When farm companies cheat H-2C workers of wages, the federal government can enforce proper payments, but the bill does not describe any punishments for companies that try to cheat their imported workers. Federal inspectors would not be allowed to make surprise visits to the worksites where H-2C workers are employed, the bill says. ‘COMPLIANCE WITH BIO-SECURITY PROTOCOLS.—Except in the case of an imminent threat to health or safety, any personnel from a Federal agency or Federal grantee seeking to determine the compliance of an employer with the requirements of this section or section 218B shall, when visiting such employer’s place of employment, make their presence known to the employer and sign-in in accordance with reasonable bio-security protocols before proceeding to any other area of the place of employment. extraordinary ability in the sciences, arts, education, business, or athletics which has been demonstrated by sustained national or international acclaim or, with regard to motion picture and television productions a demonstrated record of extraordinary achievement, and whose achievements have been recognized in the field through extensive documentation, and seeks to enter the United States to continue work in the area of extraordinary ability. Overseas, farm companies are investing in labor-saving devices. Every year, farmers and ranchers face greater challenges in finding enough workers to keep their businesses running. The labor shortage on America’s farms and ranches is growing, and the lack of a stable, legal supply of workers places the health of too many farms at risk. We cannot afford to see any more of our nation’s food supply lost in the fields. “The Ag Act’s proposed guest worker visa program would bring much needed improvements to the current system while addressing the needs of our current workforce and providing a streamlined visa process for skilled, agricultural workers in the future. Although Farm Bureau members have concerns on certain points, such as capping the number of visas, we stand ready to work with Chairman Goodlatte and members of Congress to refine these provisions for the good of all U.S. agriculture. The proposed H-2C program is a logical expansion of the federal government’s longstanding business-first, cheap-labor national economic strategy. The cheap-labor policies allow millions of foreign workers to cross the borderline into the union of the 50 states to drive down costs and to boost stock values. The migrants include roughly 8 million employed illegal immigrants, millions of “EAD” workers, unemployed refugees, plus the H-1B, H-2A, H-2B, L, J-1 and other visa-worker programs, plus the annual inflow of 1 million legal immigrants who serve as both workers and consumers. The total annual inflow of foreign workers is at least 3 million, helping to lower wages for the 4 million young Americans who join the labor force each year. This bipartisan economic policy was rejected in the 2016 election when Americans picked an outsider — President Donald Trump — to help reform the nation’s cheap-labor rules. The H-2C program would also complete a century-long trend in the meat-packing industry, where the left-wing media — such as author Upton Sinclair — helped create many urban, high-paying, unionized meatpacking jobs. Since the 1970s, and amid the ideological shift of the media from economic priorities to progressive social-issue priorities, the meatpacking industry has rapidly converted the well-paid urban meatpacking jobs into low-wage, temporary, rural jobs for many illegals, refugees, and guest-workers. However, a majority of workers in the meat-processing, and roughly half of farm workers— were still native-born Americans, according to a 2009 report. All farm workers would be Americans or legal immigrants if the employment laws were enforced — but industry pressure on politicians has blocked enforcement for decades. An Alba farmer, second from left, supervises a crew of migrant workers as they pick onions for the Oak Orchard Cooperative in Genesee County, New York, Aug. 19, 1957. The workers live in barracks or cottages at the co-op project, moving from one farm to another and harvesting different crops as they mature. Most of New York State’s big farm crops are harvested by migrant workers.